Determination of the stability of pyrope with quartz could provide theoretical pressure–temperature (P–T) constraints on silica-saturated eclogites as well as near end-member pyrope-bearing terrains. The lower P–T stability of pyrope in the presence of quartz in the system MgO–Al2O3–SiO2 can be modeled by the reaction: 3 enstatite + 2 kyanite = 2 pyrope + 2 quartz. Reaction reversals were experimentally obtained using a ½-in.-diameter piston-cylinder press and a 1000-t multi-anvil press. Besides natural quartz, all other starting materials, including orthopyroxene, pyrope, and kyanite were synthesized. The reaction has been bracketed at 1.50 GPa at 1040–1080 °C; 1.69–1.79 GPa at 1000 °C; 2.26 GPa at 920–940 °C; 2.90 GPa at 840–860 °C. The bracketed boundary is higher in temperature and pressure than that calculated using the newest dataset of Holland et al. 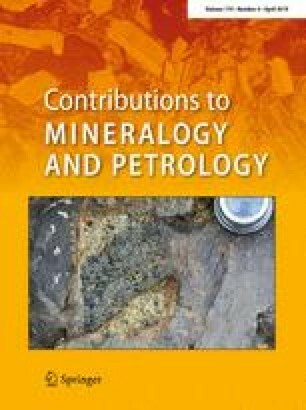 (J Petrol 59:881–900, https://doi.org/10.1093/petrology/egy048, 2018), particularly at higher pressures. Aluminum is usually thought to be taken into orthopyroxene in the form of Mg-Tschermak’s pyroxene (MgTs; MgAl2SiO6) under these experimental P–T conditions. In contrast, the observed orthopyroxene composition indicated the involvement of a non-stoichiometric component Mg-Eskola pyroxene (MgEs; Mg0.5☐0.5AlSi2O6), an aluminous orthopyroxene with octahedral vacancies (☐). End-member thermodynamic properties for MgEs as well as a mixing model for the ternary enstatite–MgTs–MgEs solid solution have been derived. The thermodynamic calculations, employing the mixing model, are in good agreement with the experimental brackets. The new model has potential applications to constrain P–T conditions of tectonic settings such as ultrahigh-pressure and ultrahigh-temperature metamorphisms. Thanks go to D. Collins for assistance with the electron microprobe analyses. Two anonymous reviewers are greatly acknowledged for their constructive and insightful reviews. T. L. Grove is appreciated for careful editorial handling. This research was supported in part by funding from the NSF Grant EAR-1725053 to DMJ. Funding was provided by Division of Earth Sciences (EAR-1725053). Compositions of pyroxenes for reaction (1) in the text may be found from the thermocalc output, as illustrated below at the indicated P–T conditions. The total Al content is calculated as Al = 2y − z, and the corresponding wt% of Al2O3 is given for comparison with the data in Fig. 3.